That is all that stands between me and graduation from my undergraduate institution. Senioritis is at an all time high... I am just ready to graduate, get married, buy a house and start Law School. Finding the gumption to get my work done and finish this semester strong has not ben easy but I am doing my best. Here are my tips for finishing that final semester strong no matter how much you don't want to. I have lists all over with everything I have to do in order of when it is due. This gives me a list with priority so I can get everything done in a timely manner according to due date. Also, constantly bumping into lists showing me everything have to do helps me to get productive and start crossing things off. Though I have a hard time following my own advice, I have been trying harder to get things done early and over a period of time instead of waiting until the last minute. I have always been a notorious procrastinator and especially when trying to finish this last semester with zero motivation I knew I could not leave it all to the end. Therefore, I got some easy papers done early in the semester when I had time and have been picking away at the others in my spare time so I don't have to do them all at once in finals week. I want to enjoy my last few weeks of college and getting things done ahead of time will allow me to do that. I got all my annoying general education and harder major classes out of the way other semesters so that my very last semester would be filled ith classes I enjoy. I have all History courses and a self-defense class this semester. Though not easy classes, they are subjects I enjoy and therefore I am not struggling through a subject I hate or something that challenges me significantly my final semester. This leaves me the necessary time to prepare for law school, finish wedding prep, find and buy a house and start packing for our move. It also gives me a nice farewell to undergrad with an enjoyable semester of learning. I have been making an effort to enjoy my last semester despite the workload. My fiance and I have weekly movie nights, I spend ample time at the barn getting some equine therepy and I am enjoying time with my college friends for the short time we will still be together. It is easy to get bogged down in work and stress and just wanting to be done so making a point to enjoy this time is very important. This is the last few months of college so make the best of them! College is some of the best years of your life. Don't let the last semester bog down your happiness or your grades. Make some memories, try for a 4.0 and just imagine how sweet it will be when they finally hand you that diploma! We can finish strong guys! 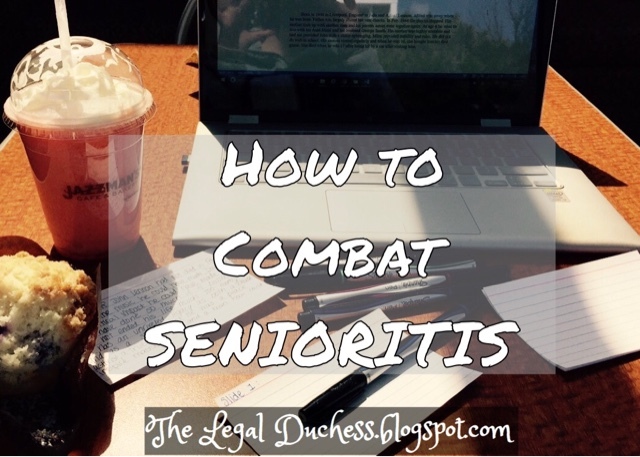 What has helped you combat senioritis?? ?